The IB learner profile represents 10 attributes valued by IB World Schools. We believe these attributes, and others like them can help individuals and groups become responsible members of local, national and global communities. Brent International School Manila is founded on the core values of our Christian heritage: love, honesty, excellence, integrity and respect for every member of the community. Membership in the student body carries with it a responsibility for the strict observance of moral and ethical behavior befitting an honorable person. Every member of the Brent community is therefore expected to show respect for themselves and others by guarding and abiding by these fundamental principles in all aspects of school life. Above all, the spirit of humility must underlie these ethical and moral standards and provide the foundation for proper conduct and accountability. At Brent, we believe in the common core value of humanity where respect of oneself, the community, and the environment is intrinsic in the Brent brand of education. With this value, our education puts emphasis on personal integrity and the principled actions of its stakeholders. We not only aim to achieve academic excellence, but also of equal importance is the promotion of personal ownership and inculcating a sense of pride of ownership in every undertaking. We teach values, culture, and the recognition that other people’s work in whatever form or media it may be is equally important. The importance of the acquisition of skills in research and the critical thinking processes that are needed to support good academic research must be thoroughly communicated to students and parents. A true appreciation of those skills will help students see academic success as the satisfaction of independently and honestly completing the tasks and academic work undertaken. Cheating or copying other people’s work often stems from the pressure that students feel to meet the high expectations of either themselves or those around them. At Brent, we want students to blossom into intellectuals who value their work and others by giving their sources the credit that they need. taking unauthorized material into an examination room (such as cell/mobile phone, written notes). It is easier to present the breach of academic honesty as plagiarism, cheating, or collusion. It is more difficult though to understand clearly what malpractice is. With this policy, we hope to be able to guide our stakeholders of good academic honesty practices and commitment. In accordance with the principles we share, we will not condone cheating, lying or plagiarism. Cheating is defined as giving or receiving any unauthorized assistance on any assignment, quiz or test, regardless of intent. Allowing a fellow student to copy your work is a form of cheating. Lying is any misrepresentation of the truth or failure to state the truth, with the intent to deceive. Plagiarism is any presentation of the ideas, thoughts, or words of another as one’s own, regardless of intent. To indicate agreement to and acceptance of the principles of Academic Honesty in our school, every Upper School student, as well as their parent or guardian, is requested to sign their name below. 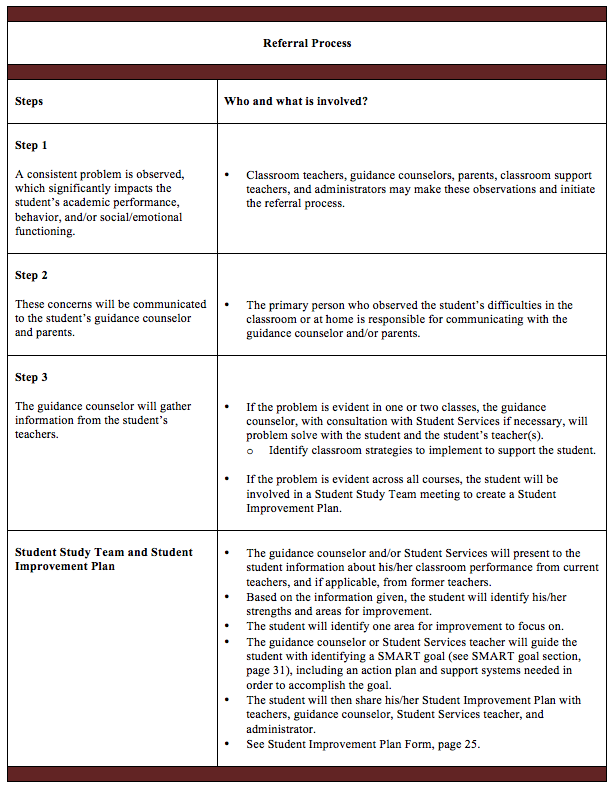 Teachers who discover student behavior in violation of the above stated principles will share that information with their colleagues, the counselor and school administrator in an effort to monitor more closely student compliance. Parents or guardians will also be informed. Students who have committed violations of this Statement may incur any of the following consequences: detention, suspension, removal or restriction from activities or dismissal from Brent International School Manila, pending authorization by the Headmaster. With my signature affixed below, I indicate agreement with this Academic Honesty Statement. 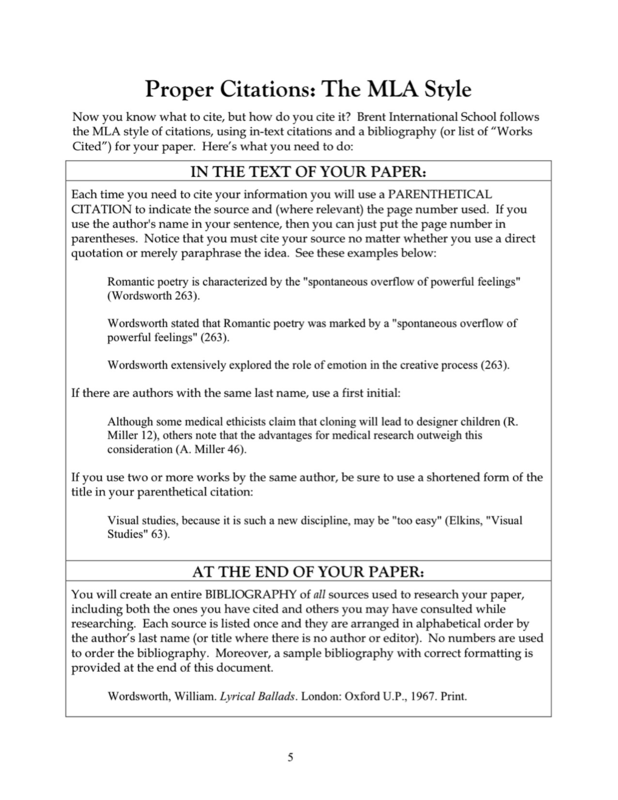 All student work submitted to a teacher is to be original, follow Brent guidelines for citing sources, etc., and is therefore subject to scrutiny, relative to cheating and plagiarism. It is important for the Guidance Counselors to know about violations of our Academic Honesty Policy and to keep a confidential file of those events. It is also important that the Counselors contact parents and make them aware of the situation and consequences, thereby circumventing an “I didn’t know” response, should there be a second occurrence, with more severe consequences. Confidentiality and protecting the name and reputation of the student must be maintained throughout. 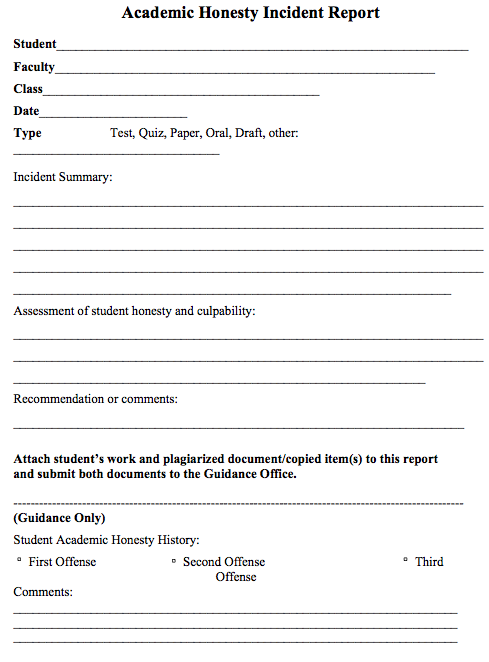 The teacher is required to fill out an Academic Honesty Incident Report (copy attached) and submit it to the Guidance Office after discussing the incident with the student. (The Incident Report may be submitted electronically). 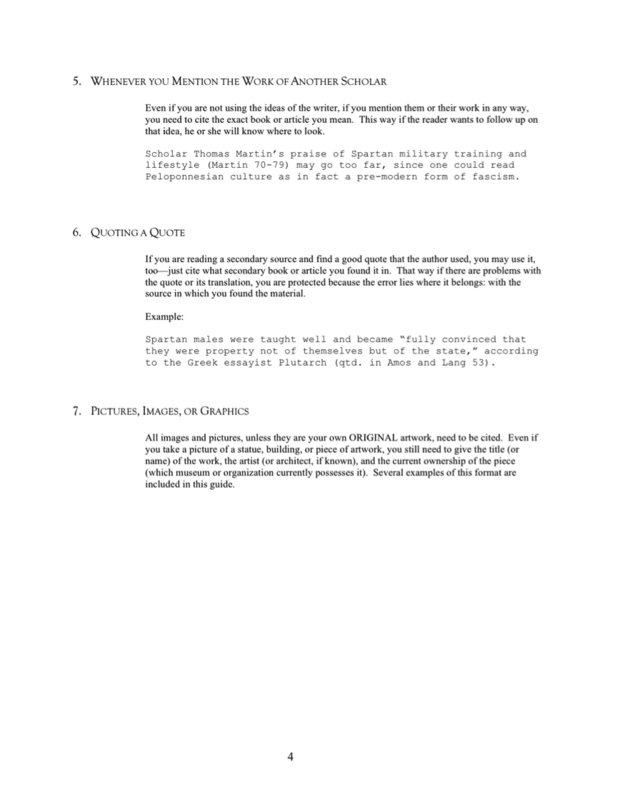 The original copy of the submitted work in question (test, quiz or other work) must also be submitted. The Guidance Counselor will call the parent and explain the offense and let the parent know of the consequence of first and later occurrences. The Guidance Counselor will keep a record of all reports, in the event that a second occurrence happens, not only in that class, or that year, but in the student’s entire high school career at Brent. If the incident occurs on an assessment for submission to IBO, the principal and IB Coordinator will be involved. The student may be allowed one chance to re-submit the re-done work provided that there is enough time for re-doing the work. 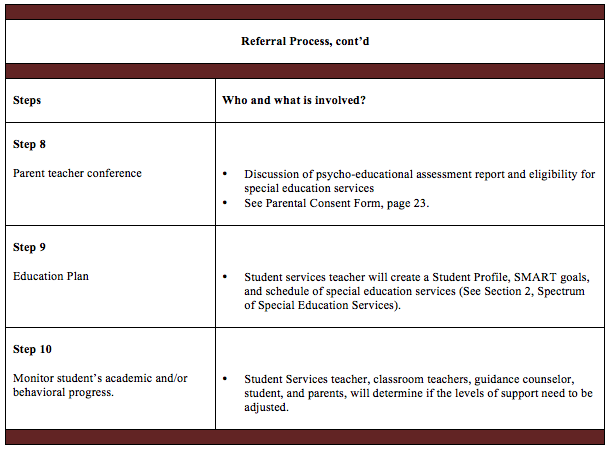 If a second offense occurs, the Guidance Counselor will send the first and second offenses to the Principal. The Principal will then instill consequences which may include removal from honor society, leadership roles, and possible forfeiture of IB Diploma. * Any exceptions to this policy will be decided by the Principal, Teachers and Guidance Counselors. According to the Brent Faculty Handbook (2012), “In accordance with the principles we share, we will not condone cheating, lying or plagiarism. FAILURE TO COMPLY WITH THE REQUIREMENT ON BIBLIOGRAPHIES, REFERENCES, AND CITATIONS WILL BE VIEWED AS PLAGIARISM AND WILL, THEREFORE, BE TREATED AS A CASE OF MALPRACTICE. Forfeiture or withdrawal of the IB diploma or certificate. Especially for juniors and seniors, instances of Academic Dishonesty might affect their college applications. With my signature affixed below, I indicate agreement with the policies outlined above and understand the corresponding consequences. Brent International School Manila. (2013). Upper School Student-Parent Handbook SY 2013-2014. Binan, Laguna, Philippines. Wallace, J. & Zadoo, E. (2012). 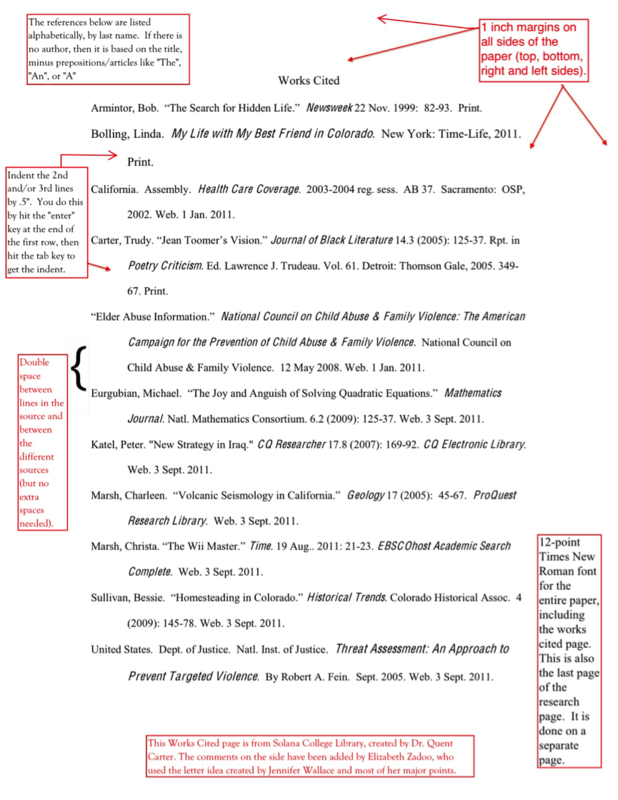 Citing your sources. Binan, Laguna: Brent International School Manila. At Brent International Schools, the primary aim of assessment is “to educate and improve student performance” (Wiggins, 1998). Assessment policies and procedures stated in the school’s Student-Parent Handbook read as follows: “At Brent, assessment is integrated into daily classroom teaching. It is an ongoing process, based on multiple sources of evidence including tests, observations, portfolios, interviews, performances and projects designed to inform the learning of both student and teacher. Regular assessment in which students are active participants allows students to take responsibility for their work and to support their growth as life long learners” (Brent Student-Parent Handbook, 2008). Assessment involves processes and procedures which provide: 1) goals and educational objectives to attain; 2) feedback concerning student progress towards those goals; and 3) opportunities to gather, record and report information regarding progress to students, parents, and other stakeholder groups. Are transparent and clearly understood in method and purpose. Behaviorist theorists (Thorndike, 1913; Skinner, 1950) suggested that learning is a process of developing connections between stimuli and responses. Learning is therefore motivated by the rewards or punishments that occur as responses to their behaviors. Behaviorist curricula consisted of learning experiences arranged sequentially from least complex to most complex (Gagne, 1968). While effective in explaining some basic behaviors, the behaviorists’ limited explanations of learning gave way to theories, such as Bandura’s (1989) social learning theory, that contribute to a cognitive perspective of learning. Cognitive learning theories build on three major tenets (Resnick, 1989). The first is that learning is not the accumulation of knowledge, but the active construction of knowledge (Piaget, 1950). The second is that knowledge construction is built on existing knowledge and is dependent on existing knowledge (Vygotsky, 1978). The third is that learning is both social and context specific (Cobb and Bowers, 1999). Learning is therefore interpreting information based on existing knowledge and the nature of the context where learning occurs. Later cognitive research on learning moved away from focusing only on the individual cognitive process of constructing knowledge, to the interactions between people in social contexts (Greeno, 1998). The perspective that emerged from the new focus on interactive systems is called the situative perspective (Cobb and Bowers, 1999; Greeno, 1998). Individual learners are participants in a greater dynamic where they make sense of knowledge based on their interactions with other learners within the social contexts in which learning occurs. As a result of the progression of learning theory, models of assessment have adjusted from measuring the breadth of knowledge students acquire, to considering the performance of students acting on knowledge in specific contexts. The resulting Brent model of assessment is one that focuses on providing students with varied opportunities to perform or act on knowledge in context, and to transfer mastery of knowledge and skills to new contexts. 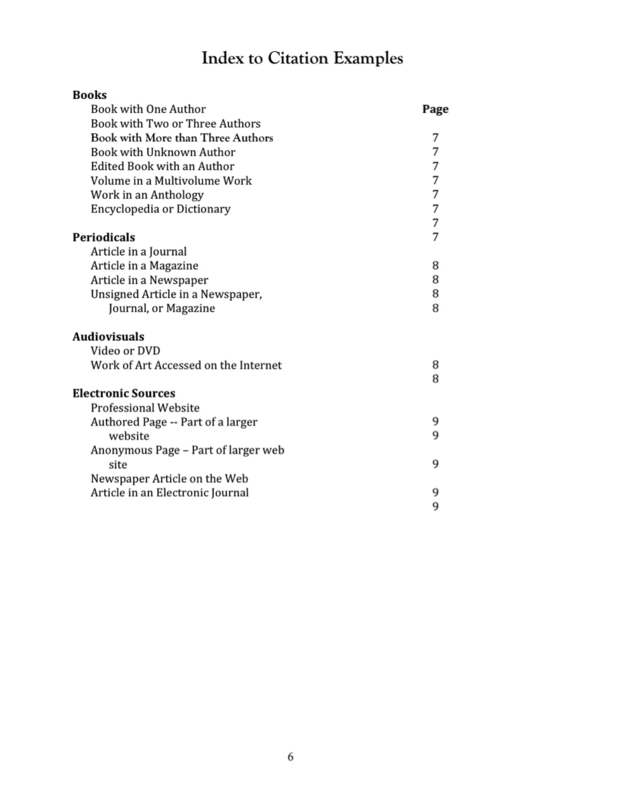 Criteria: conditions to be met to achieve goals – e.g., “persuasive and clear” writing. Brent International Schools consider academic achievement to include subject-specific content, thinking and reasoning skills, and general communication skills (Marzano, 2000). The Brent academic standards are the goals of student achievement, and the benchmarks allow for achievement to be measured and reported. Student achievement, therefore, is the amount of subject-specific content students learn, the extent to which students demonstrate thinking and reasoning skills at an appropriate level, and student ability to communicate effectively the content and reasons they have engaged. Achievement variables are the focus of the assessment and reporting process. The assessment process should control for achievement variables, isolating them from non-achievement variables. Non-achievement variables include effort, behavior, attendance, etc. In-class participation can reveal true student achievement and can be a part of an achievement grade if measured by a rubric, and anchored to achievement variables such as mastery of content, thinking or reasoning, and communication. Participation grades should not be included based on subjective teacher perception and experience alone. There is a debate on the validity of late work penalties in the measure of academic achievement. While promptness is not a measure of the mastery of content, it is a necessary component of effective communication and is a part of effective reasoning. The International Baccalaureate (IB) honors the internal deadlines set by schools, and also requires IB internal and external assessments to honor IB deadlines. Consistent with the IB policy and practices, therefore, the non-achievement variable of late submission of work can affect student achievement scores and reported grades. Brent Schools believe there is a valid basis for providing feedback to students regarding non-achievement variables and will specifically report non-achievement variables in conjunction with achievement variables. Assessment is defined within the IB Diploma Programme Assessment Principles and Practice (2004, p.3) as “a term used to cover all the various methods by which student achievement can be evaluated.” Formative assessments lead to reflective practices by both the student and teacher. They direct future student learning as well as further instruction by the teacher. Summative assessments determine the level of knowledge gained through a particular course of study. Formative and summative assessments together provide a picture of what a student has learned up to that assessment date. Brent assessments provide a variety of methods of formative and summative assessments. “At Brent, assessment is integrated into daily classroom teaching. It is an ongoing process, based on multiple sources of evidence including tests, observations, portfolios, interviews, performances and projects designed to inform the learning of both student and teacher. Regular assessment in which students are active participants allows students to take responsibility for their work and to support their growth as life long learners” (Brent Student-Parent Handbook, 2008). IB uses the words “latest” and “fullest” to describe the type of assessment that they believe will give the best picture, the best feedback, of student achievement. Both concepts come from sound assessment theory and are most assuredly a part of the Brent assessment process. “Latest” implies that assessment occurs after students have had ample opportunity and time to develop a mastery of content and skills in a conceptual area. “Fullest” implies that varied assessment methods are applied to student experience in order to gain a fuller picture. Jay McTighe explains this concept effectively in the example of a snapshot versus a photo album. A photo album gives us a better and fuller picture of an event or a person because there are multiple pieces of evidence gathered in a variety of ways over a period of time. A snapshot is a one-time glimpse of a person or an event, providing limited exposure to the topic. It is the UbD philosophy to view the assessment process as a photo album, a collection of evidence of student achievement. The Brent academic program has been built on UbD principles. The Brent assessment practice therefore addresses the fundamental importance of assessment providing feedback about student mastery of specific concepts/content. It is therefore important that meaningful feedback be provided uniformly across subjects and teachers. In this case, the concepts and content are derived from the standards and benchmarks of the Brent curriculum. Brent operates on a unit-based curriculum. Using units breaks down the greater Brent curriculum into smaller concept-based units so that concepts can be sequenced into the best process of learning. Teachers teach individual units that connect to the greater conceptual progression of the curriculum. 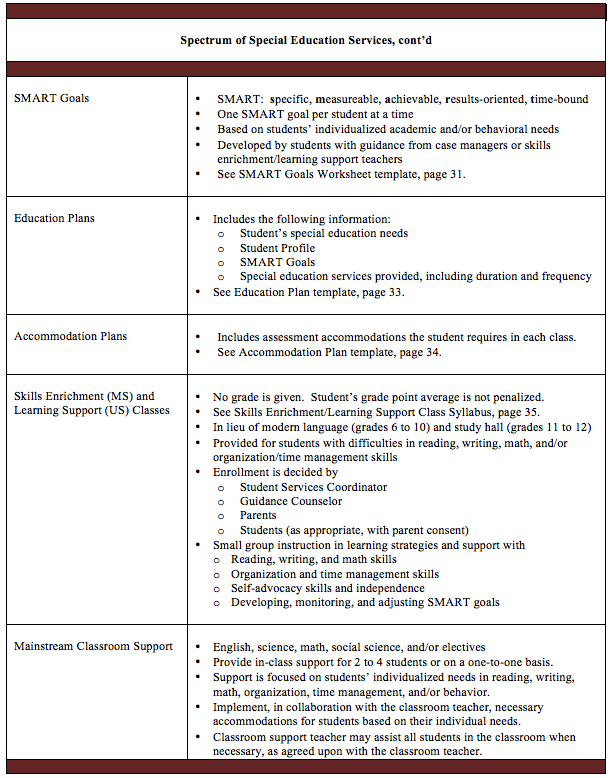 While connected to the greater curriculum, units stand alone and a unique assessment strategy is developed for each unit. The assessment strategy requires a performance task, and a variety of evidence of students’ achievement of standards and benchmarks. 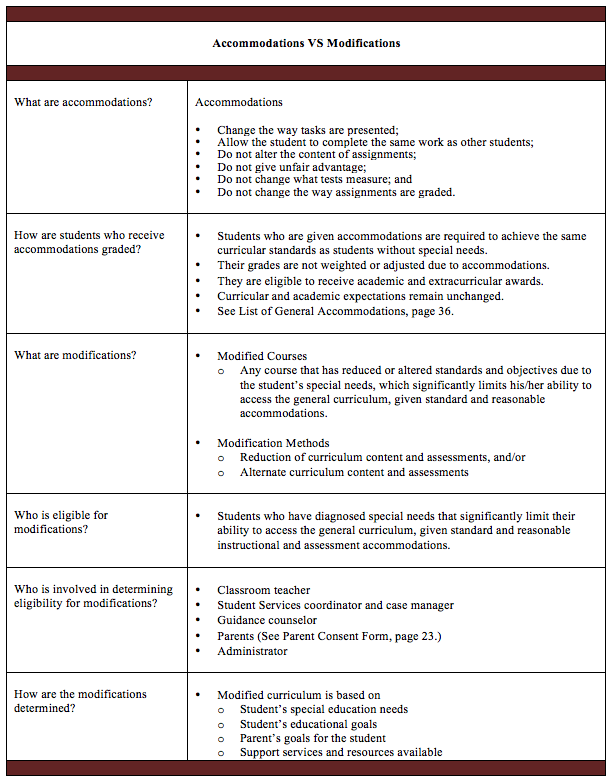 The criteria by which students are evaluated are also required in the UbD unit model. The Stage 3 Learning Plan requires teachers to strategically place assessments, content, and learning activities in a unit calendar so that they can shape and track student achievement throughout a unit, and collect evidence of student achievement at valid points of time. Brent does not consider latest and fullest to apply to a semester, but rather to a unit of study. Students are not competing against each other, but are attaining against the established academic standards and benchmarks. Criteria and expectations by which students will be measured are not a secret, but are clearly understood and expected. Assessments are designed so that students can achieve proficiency. Assessments involve the demonstration of proficiency, not guesswork. Performance assessments do not assume a single correct answer. 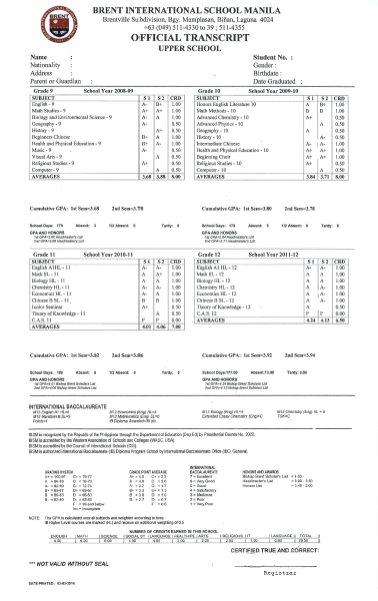 Brent Schools are committed to generating grade data and tracking student achievement against the established academic standards and benchmarks. Grade generation is determined to meet the needs and expectations of the consumers of grade data, and the type of data they require. For example, up to 70% of students at any Brent campus are pursuing college and university acceptance in North America. A percentage of students at Brent Schools also take IB Diploma or certificate exams. 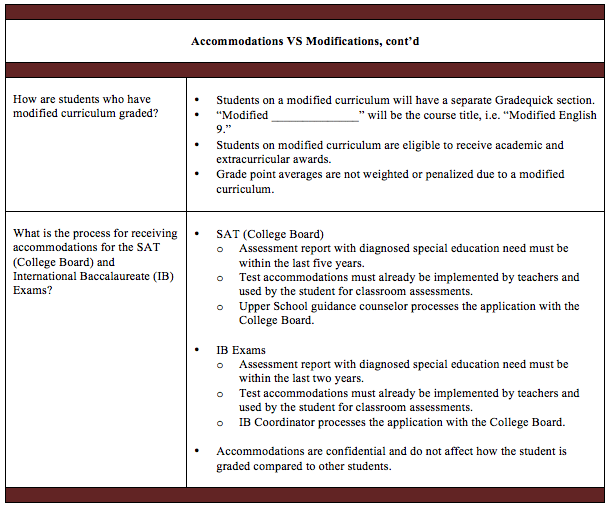 The IB assessment policy and procedures indicate that IB uses a 1 to 7 grading scale. Students in grades 11-12 who are diploma or certificate students, therefore, are provided with predicted grades and regular feedback using the 1 to 7 IB grade scale. Current Brent reporting uses an A to F scale in which a GPA can be determined. With IB courses we also grade using the 1 to 7 scale. Both scales are based on descriptors that represent standards of attained knowledge and skills. To date, North American university admissions rely greatly on SAT I and SAT II results as well as Grade Point Average. For this reason all grade 11 students and interested grade 10 students sit the PSAT, which provides both preparation for the SAT and a starting point for making college choices. The IB grades are the basis for providing advanced placement or credits. The vast majority of our student body should be able to present strong credentials, reflective of the wholeness of their education and recommendations from teachers and guidance counselors who vouch for their active role in the education process, thus providing US colleges and universities with grades based on A-F and impressive GPA. To serve the vast majority of our student population, we uphold the use of grade reporting using A-F. The IBO, in its website clearly states, “The IB Diploma is widely recognized by universities around the world. However, it is universities and not the IB that determine admissions criteria and these can vary significantly by country, university, course, and over time. Therefore, you are strongly advised to consult the university directly to ensure that you have the latest, most accurate information.” This statement is a strong indication that the IBO recognizes and respects the uniqueness of each country and university’s admissions policy. Educators at Brent Schools are then able to use grades A-F while simultaneously using the IB scale of 1-7 in preparation for the various internal and external assessment requirements that take place at intervals throughout the two-year program. The Brent assessment model seeks to manage the validity and reliability of the assessment instruments/experiences, and the inter-rater reliability of those evaluating the assessment. To address the need for instrument validity and reliability, and inter-rater reliability between evaluators, teachers are charged with developing and implementing common assessments for units, as well as to moderate grading comparing assessment evaluations. It is the Brent position that the quantity of work assigned to students does not have a direct relationship to student learning. Teachers and administrators must therefore monitor and determine collaboratively the quantity and quality of work required for both summative and formative assessments. Consistent with Airasian’s purposes for grading, the primary goal of Brent assessment is to provide students with feedback about their achievement. Even the Measures of Academic Progress (MAP) tests, which are given in part for guidance in course selection and instructional planning, are primarily to inform students about their overall progress. This goal requires assessment to be connected to the measure of achievement (standard and benchmarks), to target the concepts (big ideas and understandings), to provide students the opportunity for transfer, and to utilize content and skills that support the above elements. Assessment #1 measures twice the information and skill in the topic as #3. 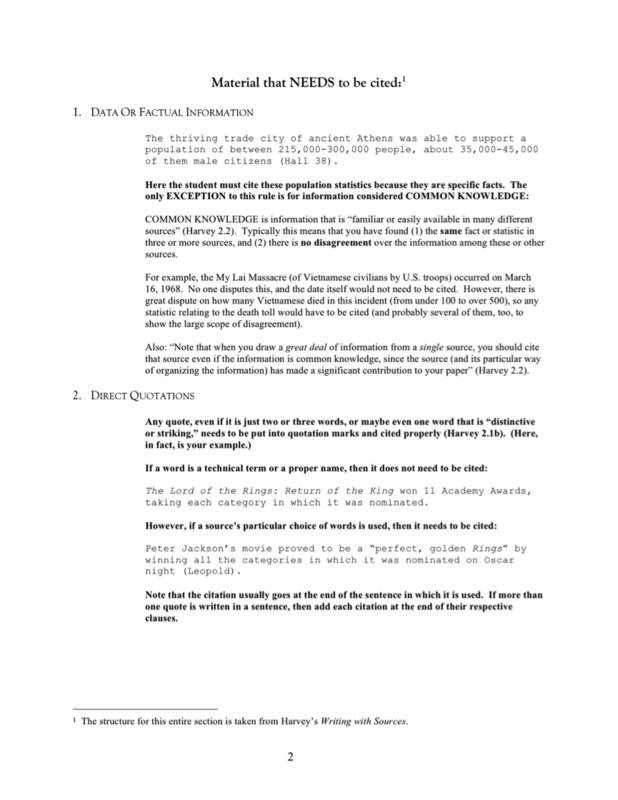 Assessment #4 measures five times the information and skill in the topic as #3. 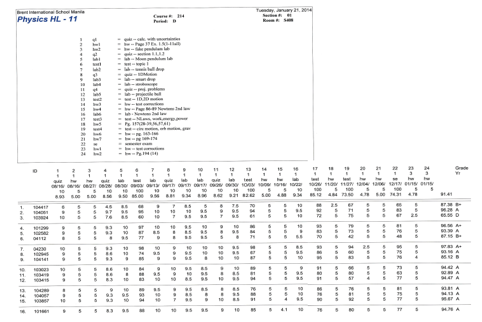 Total: = 79/115 which is 68.7%. 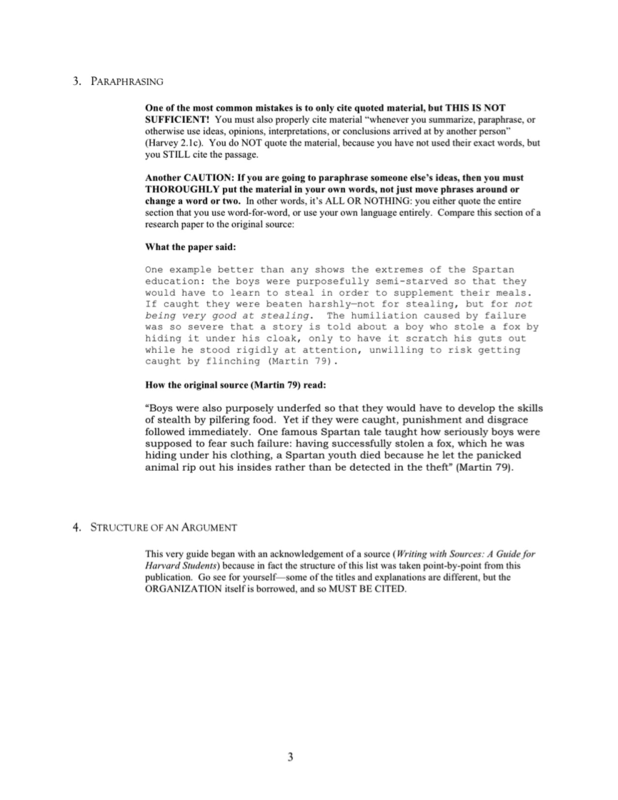 The use of the point method depends on how a grading period is defined. In the Brent curriculum, a grading period can be defined primarily as the length of a unit. Grade reporting occurs on a semester and annual basis. Semester and annual grades can be derived from the accumulation of unit grades. Units must be clear about the topic/concept they are teaching and assessing. Assessments must not be weighted according to type, but according to the content/concept and skill they are assessing. Assessments must be clear about the depth and quantity of content and skill they are assessing, and be weighted accordingly. Units must be weighted in significance, based on the topic, in order to derive a semester or annual grade. Raw data can be produced from teacher defined possible scores as well as rubrics. Letter grades can be assigned, based on Rubrics, rather than raw numerical scores. 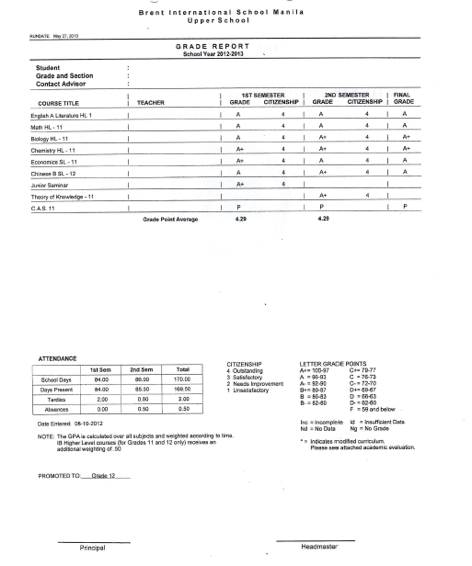 Grade reporting includes content specific feedback, as well as an overall grade. Non-achievement data is reported separately from achievement data. Grades are ultimately reported as an A to F letter grade (also +/-) where each number represents a category of achievement, A+ being the highest. 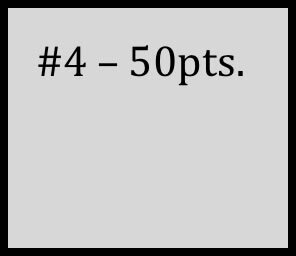 Using the point method a teacher’s grade book report might look like the example in Appendix 1: The Grade Quick Teacher Grade Book showing breakdown of weighted topics. 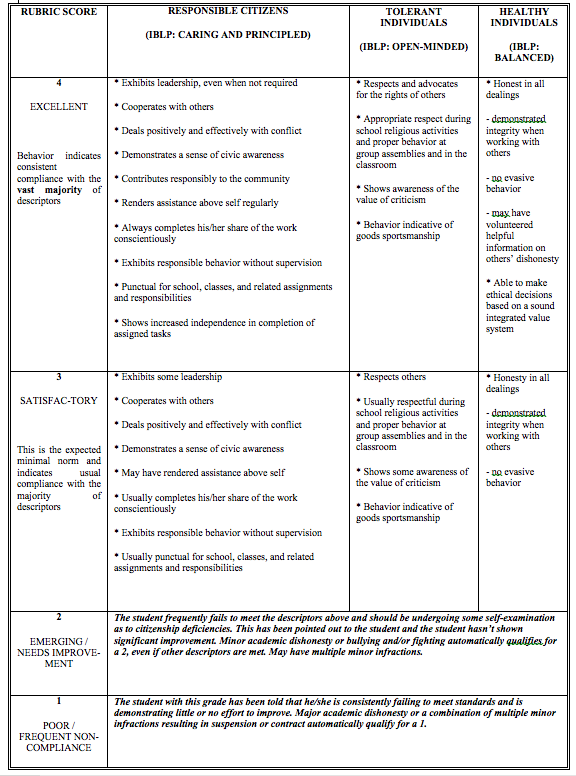 Non-achievement data is reported via citizenship scores using the rubric below, and through comments written on progress reports. A sample of the Progress report is in the Appendix, labeled as Appendix 2. Since it is a progress report, the non-achievement data reported as the Citizenship Grade is not included. 13.1 All assessment components for each of the six subjects and the additional IB Diploma requirements must be completed in order to qualify for the award of the IB Diploma, except under the conditions stipulated in articles 23 and 24 of these regulations. 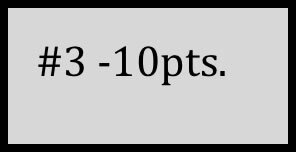 13.2 If a diploma candidate is awarded a grade E for TOK or a grade E for the extended essay, the candidate must achieve 28 points or more to be eligible for the diploma. However, if a candidate is awarded an EE for both TOK and the extended essay requirement, the candidate will not qualify for the diploma regardless of the total number of points achieved. 13.3 The IB diploma will be awarded to a candidate whose total score is 24, 25, 26 or 27 points, provided all the following requirements have been met. Numeric grades have been awarded in all six subjects registered for the IB Diploma. All CAS requirements have been met. 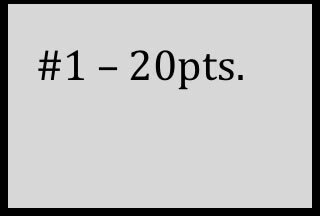 At least a grade D has been awarded for both TOK and the extended essay. There is no grade 1 in any subject. There is no grade 2 at higher level. There is no more than one grade 2 at standard level. Overall, there are no more than three grades 3 or below. At least 12 points have been gained in higher level subjects (candidates who register for four higher level subjects must gain at least 16 points at higher level). At least 9 points have been gained on standard level subjects (candidates who register for two standard level subjects must gain at least 6 points at standard level). The candidate has not been found guilty of malpractice by the IB Organization. 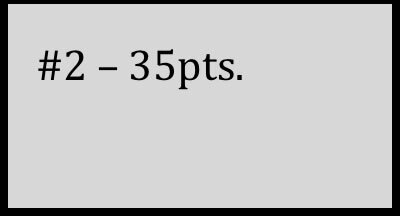 13.4 The IB diploma will be awarded to a candidate whose total score is 28 points or above, provided all the following requirements have been met. Grades A (highest) to E (lowest) have been awarded for both theory of knowledge and an extended essay, with a grade of at least D in one of them. There is no more than one grade 2 at higher level. There are no more than three grades 2 at standard level. At least 11 points have been gained on higher level subjects (candidates who register for four higher level subjects must gain at least 14 points at higher level). At least 8 points have been gained on standard level subjects (candidateswho register for two standard level subjects must gain at least 5 points at standard level). 13.5 A maximum of three examination sessions is allowed in which to satisfy the requirements for the award of the IB diploma. The examination sessions need not be consecutive. 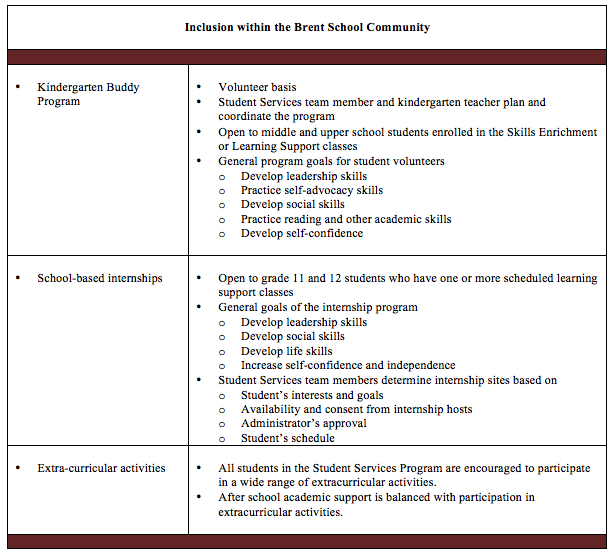 In addition, Brent teachers are provided with an approximate comparative scale that connects the IB 1 to 7 scale to the Brent A to F scale. This is applied to IB assessments only, and is given as a predicted score in nature. 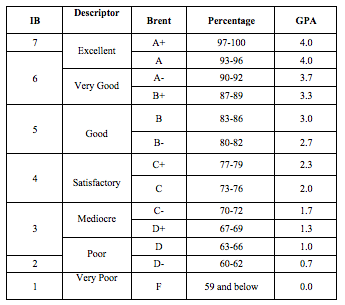 IB or IB style assessments are graded using the IB assessment criteria and may be converted to letter grades and Brent percentages using a conversion such as the modern language example below. Even such conversion charts, however, must be used in conjunction with the teacher’s professional judgment. IB assessment criteria are summative in nature. So, teachers of subjects working on more developmental skills must employ a sliding scale that takes into account the time frame of the assessment within the two-year program. Below is a sample of a chart that language teachers use as basis of Brent grades per subject per component assessment per level. follow the elements of educative assessment. are designed to balance the quantity of work required for students in both formative and summative assessments. 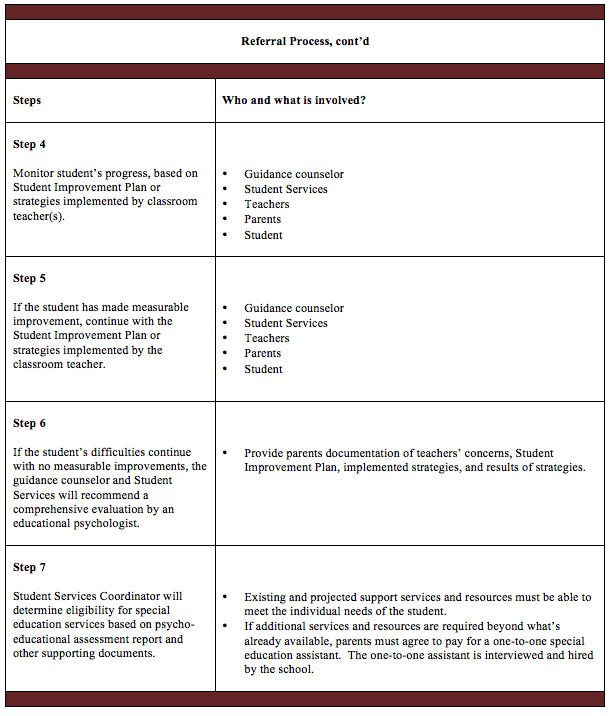 report student achievement in specific conceptual areas that are derived from the Brent standards and benchmarks. Brent Education Alignment: Consistent with the Brent Schools, Inc. board mandated alignment of all Brent schools, any Brent School delivering the Brent Education will implement a common assessment policy. Grading Period: An assessment strategy should be developed for each grading period. A grading period is defined as the length of a concept-focused curriculum unit, developed in the format of Understanding by Design (UbD). Student Achievement: For the purposes of Brent assessment, student achievement is defined as subject-specific content, thinking and reasoning skills, and general communication skills. Achievement Variables: The assessment process must control for achievement variables. Non-achievement variables may also be reported, but are isolated in a separate reporting category. Standards–based: Assessments are explicitly to assess student achievement against the Brent academic standards and benchmarks. Assess Understandings: Assessments are to assess students on the Understanding by Design concept of Enduring Understandings. Transfer: Assessments are to assess students’ capacity to apply concepts and skills in new situations, in appropriate ways. Quantity Regulation: Determining the appropriate quantity of work covered on an assessment is important because it can affect student achievement. Varied: The assessment strategy for a unit must utilize various assessments that include diagnostic, formative, and summative assessments. Differentiated: The assessment strategy must incorporate differentiation strategies to accommodate different learning styles and language needs. Weighting: Grade weighting will only be applied to how the assessment relates to the depth or quantity of content and skills which it will address. Everything Counts: All possibilities of student achievement in class, outside of class, in groups, and at home, are to be counted towards student achievement. This does not mean, however, that all assessments are averaged and of equal value. Evidence: All items that are assessed must be assessed using a tangible instrument, i.e. a rubric or a scale. Common: All courses where multiple sections exist must deliver at least one identical diagnostic, formative, and summative assessment for each unit that is taught. One of these assessments should be a performance-based transfer task. No Norms: Teachers must not norm student achievement scores. This includes the use of curving grade distributions. Validity and Reliability: The performance task for every unit will be moderated by common teaching teams to ensure validity/reliability, and consistent marking. Self-assessment, peer-assessment, and self-reflection of student learning are incorporated in every IB course. Student Feedback: The primary reason for grade reporting is student feedback. Timely: Feedback for assessments must be provided in a timely manner. In addition to semester and annual grade reports, students will receive a timely grade for each unit of study, and each component of a unit. Content Specific: Overall grade reporting will include disaggregated reports of student achievement in specific content areas. Standards–based: Grade reports are to explicitly report student achievement against the Brent academic standards and benchmarks. This may be done by reporting on the big ideas (concept and content areas) of the standards and benchmarks chosen for a unit of study. IB Diploma Courses: Grade reporting for IB diploma courses will include both the Brent grade and an IB grade based on the IB 1 to 7 scale or the IB assessment criteria for the specific assignments that contribute to the IB Diploma grade, and for assessments that mimic or approximate the official IB assessments. General Policy: Consistent with the Brent General Assessment Policies, homework must be varied, must be counted towards student achievement, and must be returned with feedback in a timely fashion. Quantity Regulation: The quantity of student homework must be monitored by faculty and administration. “The quantity of internally assessed work specified for a course must be no more than the minimum needed to satisfy its aims. Defined word limits should be given where possible for internally assessed tasks. The maximum word limit should be no more than is necessary to complete the task” (Appendix B. p. 55) (IBO, 2004). Appendix 4. 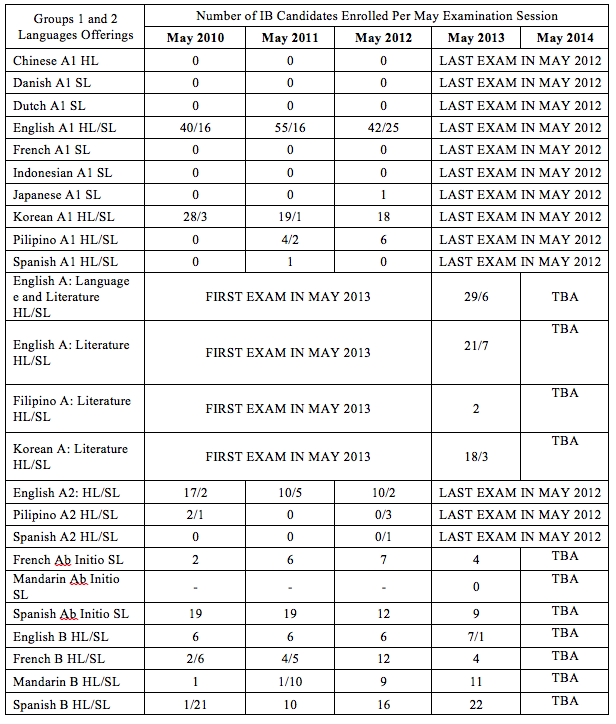 Official Transcript of Records issued to students after the July issue of IB results. Bandura, A. (1989). Social cognitive theory. 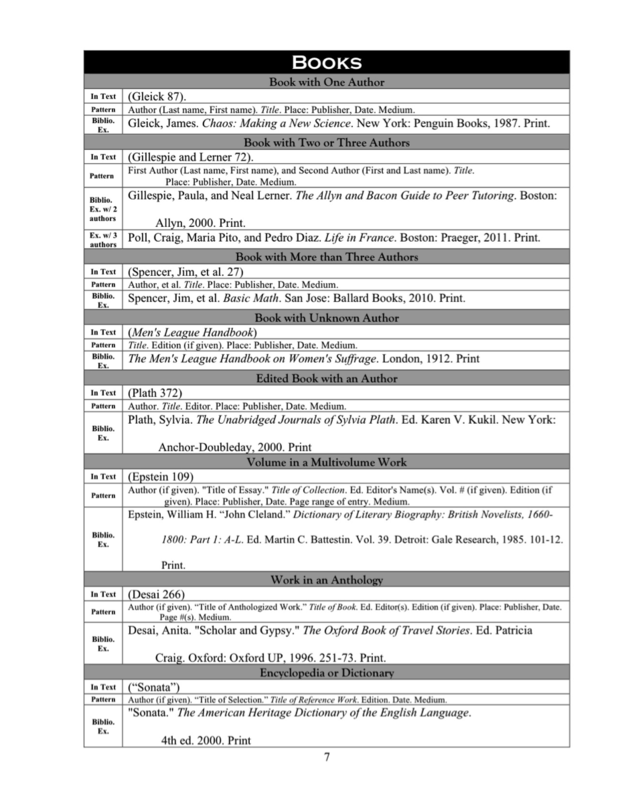 In R. Vasta (Ed. ), Annals of child Development: Vol. 6. 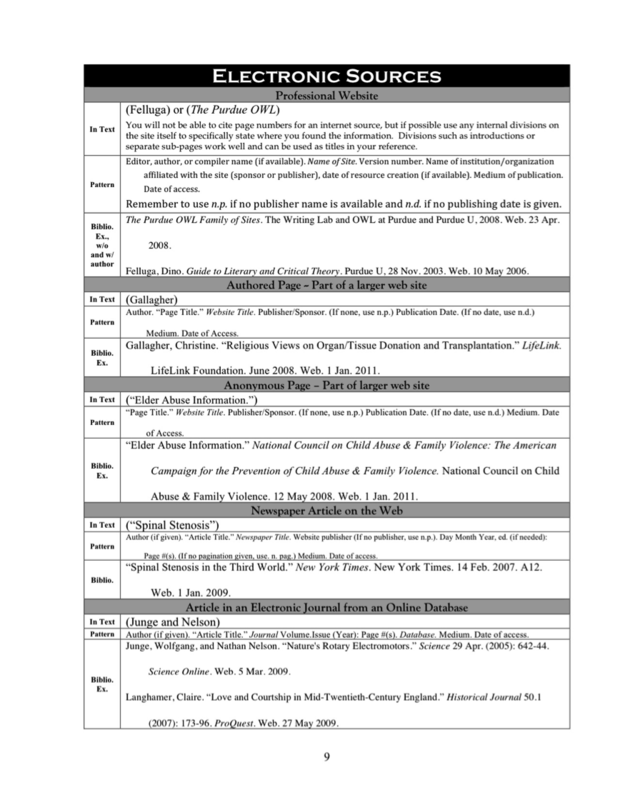 Six theories of child development (1-60). Greenwich, CT: JAI Press. Brent International School, (2008). Brent Student-Parent Handbook. Manila: Brent International School Media. Brent International School, (2009). 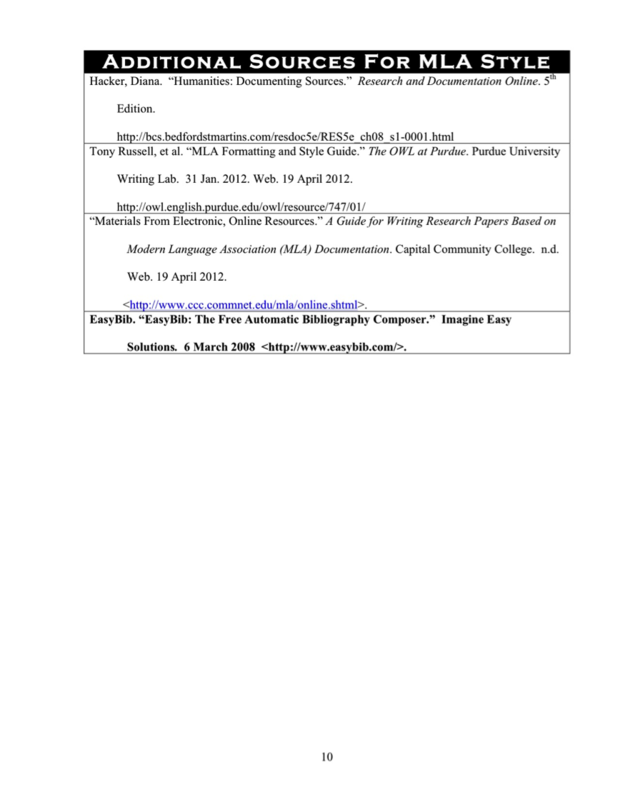 Position paper on school improvement. Manila: Brent International School Media. Cobb, P., and Bowers, J. (1999). Cognitive and situated learning perspectives in theory and practice. Educational Researcher, 28, 4-15. Gagne, R. M. (1968). Learning hierarchies. Educational Psychologist, 6, 1-9. Greeno, J. G. (1998). The situativity of knowing, learning, and research. American Psychologist, 53(1), 5-26.
International Baccalaureate Organization (2004). Diploma programme assessment principles and practice. Chippenham, Wiltshire: Anony Rowe Ltd. for IB. International Baccalaureate Organization (2011). General regulations: Diploma Programme. Cardiff, Wales, UK. Resnick, L. (1989). Knowing, learning, and instruction: Essays in honor of Robert Glaser. Hillsdale, NJ: Earlbaum. Thorndike, E. (1913). Educational Psychology. New York: Columbia University Press. Wiggins G., McTighe, J. (2005). Understanding by design. Alexandria, VA: Association for Supervision and Curriculum Development. English is the medium of instruction at BRENT INTERNATIONAL SCHOOL Manila and the language for IB examinations of IB School 000432. Brent International School embraces the following beliefs about learning, students, and the education they require. Each student is entitled to access fair opportunities to excellent education. Each student brings rich cultural and linguistic background to the school community. Each student needs to develop and maintain his/her native language to successfully acquire another language. Each student is a shared responsibility of the entire school community. Each student has a unique learning style that is addressed by varied teaching strategies and techniques. Some students may not have a first language. Monolingual English speakers are encouraged to achieve at least basic proficiency in a second language. Since Language is central to learning, all teachers are, in practice, language teachers. Successful education involves effective relationships and communication between students, parents, and the school. Parents play an irreplaceable role in the language learning of their children by developing reading and writing skills in the first language. Critical periods of language acquisition dictate the success of students and the methods employed for language education. Language is fundamental to knowledge, and therefore essential to the education process. In addition to listening and speaking, reading and writing are absolutely fundamental to language development. Acquiring and learning a language has varied purposes. The Department of Education of the Philippines (DepEd), Order number 37, series of 2003 provides guidelines for students receiving instruction in the national language (Filipino) language. 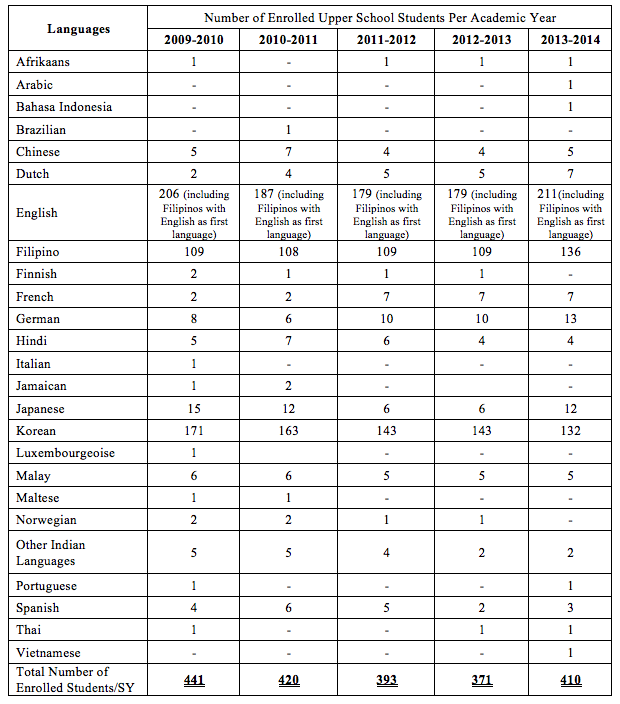 The order states that in high school, students should receive up to two hundred forty minutes of instruction in Filipino and three hundred minutes of instruction in English each week. Currently BRENT INTERNATIONAL SCHOOL MANILA has other teaching time devoted to Filipino Language teaching in relation to this DepEd requirement. Presidential Decree no. 2022 signed on 31 January 1986 by then President Ferdinand E Marcos recognizes BRENT INTERNATIONAL SCHOOL MANILA as an international institution. It provides a clause that “to enable the school to continue to implement, execute, or improve its curricular standards and educational program, the school shall determine its own curriculum, standards and medium of instruction, teach whatever language or languages it may deem proper…to maintain the standard of education it has adopted.” (Section 2.a) Due to this provision and as an international school delivering the IB Diploma program in English, the school has some degree of flexibility in terms of the hour requirement of the teaching of Filipino. This explains the unique position of the school to be able to teach Filipino to its Filipino nationals while at the same time supporting requirements and spirit of the IB Diploma process. The school’s status as an international school provides it with exemptions from certain legal requirements as stated earlier. BISM adheres to the following practices that were developed primarily for the ESL program manual, but are adapted for all language instruction programs where appropriate. The teaching of both Basic Interpersonal Communicative Skills (BICS) and Cognitive Academic Language Proficiency (CALP) (Cummins, 1979) language. The development of macro-skills of listening, speaking, reading and writing in meaningful context. The Functional Approach to instilling understanding of phonology, morphology, syntax and semantics. The Genre Approach to help students acquire skills in writing and reading varied texts with varied conventions of text structure, organization and appropriate language. Concurrent and content-based instruction consistent to the core curriculum of the school. Sheltered instruction where both the teaching of content and language are the goals of the program. Immersion and gradual mainstreaming which allow students the opportunity to perform with peers. Language Across the Curriculum that advocates all subject teachers to raise their awareness of the language demands of their specific subjects. Collaborative instruction in which teaching of ESL students is a shared responsibility of ALL teachers. Assessment tools that test the competency and proficiency levels in listening, speaking, reading and writing throughout their language development. Planning of language courses suitable for learners at Brent International School Manila depends on admissions testing results and interest of students and parents. English Language learners are placed according to proficiency levels and according to their progress towards required mainstream English proficiency. Courses are offered and scheduled to meet the needs of the student population at any given time. Language Courses other than English are offered depending on the critical mass of students requiring and wanting such courses. 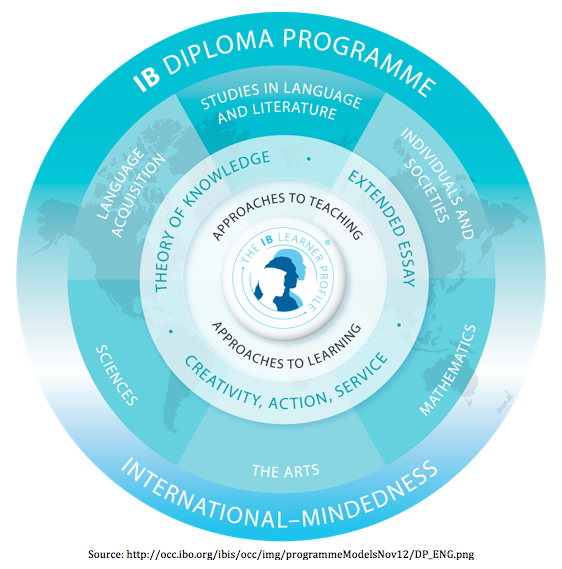 The school provides appropriate support for students’ language development prior to their first year in IB to fulfill the Group B or Language Acquisition course requirement of the IBDP. Support can be provided either by offering literature courses in the students’ first language, such as Korean and Filipino in grades 9 and 10 or assisting students in seeking appropriate and capable teachers from the Brent community and at the same time providing appropriate materials in ensuring IB required language instruction in the event that students will need to do a Group 1 Studies in Languages and Literature following the Literature School-Supported/ Self-Taught program. We can safely say then that we provide first language support to Korean, Filipino, and School-Supported/Self-Taught Languages. English Language and Literature and English B are offered at school both at the Higher and Standard Levels. In the IBDP, offering Group 1: English Language and Literature and Group 2 English B allows students to do the Group 1: Literature Self-Taught SL in the students’ first language. This proved beneficial to our students because they are able to be in the IB Diploma and at the same time fulfill the required English credits for graduation. The provision of Group 2: Language Ab Initio in French, Mandarin, and Spanish further enrich and support the language learning at school. This allows students to be studying two or, in some cases, three languages in their Diploma Subject Group options fulfilling the requirements of Groups 1, 2, and 6. The changing demographics of the school caused the school to review its ESL program in the Upper School beginning school year 2010-2011. The predominant enrolment of one Asian country nationality in the previous academic years gradually declined and more students with English as their first language increased in number. Although the school’s admission policy states that, “Applicants requiring ESL support in grades 9-12 will not be accepted,” the Upper School has had some flexibility in this area to offer ESL 4 classes when needed. Mainstream students who may need additional support in English, can study Grade 9 English Literature and at the same time attend an ungraded ESL support class in lieu of a second language. 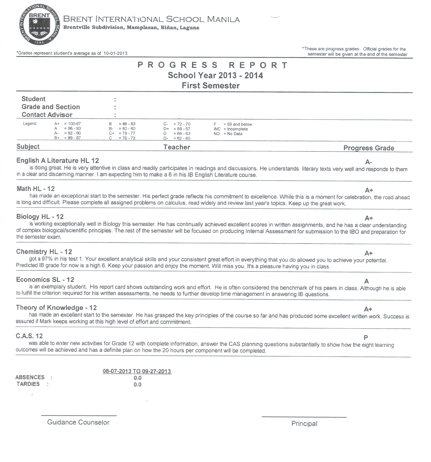 Brent International School Manila has adopted the MLA style guide to provide standard formatting for student work. The style guides are distributed to each student. The IB Diploma program courses demand students to critically think about the world they live in. Instruction and writing in the majority of classes offered at Brent Manila occurs in the primary language of instruction at the school, English. Therefore, Brent International School Manila expects that each student at Brent should be able to critically engage the world in English in grades eleven and twelve. 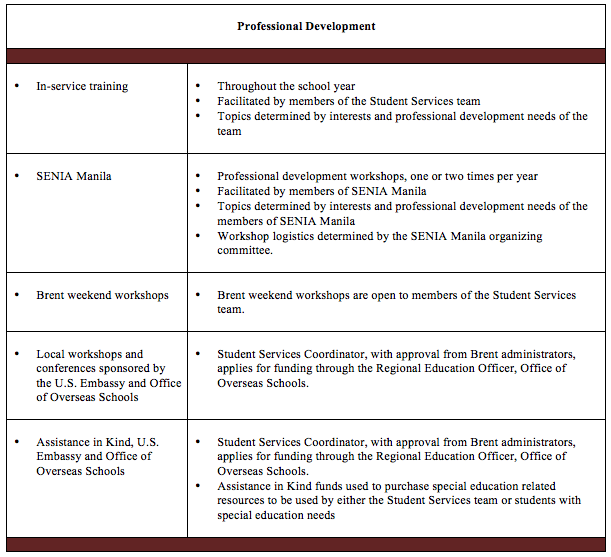 Brent International School Manila engages in a five-year curriculum review cycle where academic departments review their program from curriculum to instruction to materials and resources. For IB courses, the school reviews materials and resources according to the cycle published by IB. English is the medium of instruction, and therefore English use is encouraged in order to support proficiency. Opportunities are given to parents to be fully informed in both the Language programs offered by the school, and be educated about the importance of the home in language acquisition in the educational process. First language courses will be offered where appropriate support can be met internally or externally, i.e. independent study. Each student at Brent must be able to critically engage the world in English in grades eleven and twelve. MAP tests in Language, Reading, and Math are used for placement. Writing samples are reviewed by the ESL Head of Department for Middle School and Upper School applicants to advise the ESL level. The Admissions Committee reviews writing samples in Lower School. Interviews with the Director for Admissions, Guidance Counselor, and Principal are conducted for final placement or to determine courses to be taken. ESL level placement options include: In grades 1 through 5 ESL 1, 2, and 3; Grades 6 and 7-ESL 2, 3, and 4; and Grade 8-ESL 3 and 4. As a practice, we do not take ESL in the Upper School, but there is some flexibility in grade nine. After appropriate level placement, ESL students are expected to study in each level for only one (1) semester before moving on to the higher level. Student performance, achievement, and grades are closely monitored while students are in the ESL program. MAP testing scores in Reading and Language are used for placements. In cases when ESL students fail to meet the criteria for promotion, students are subject to Academic Warning or Probation. The ESL students’ grades, recommendations from the ESL specialist and mainstream teachers, and MAP results determine the completion of the ESL program. The HOD/Coordinator then communicates the completion of the program to the principal for appropriate action and placement. Sutherland, Ian, Dr. Maria Cristina R Pozon, Marjorie D Alcantara, Regine de Blegiers, James Richmond, and Charles W Mock, Father. 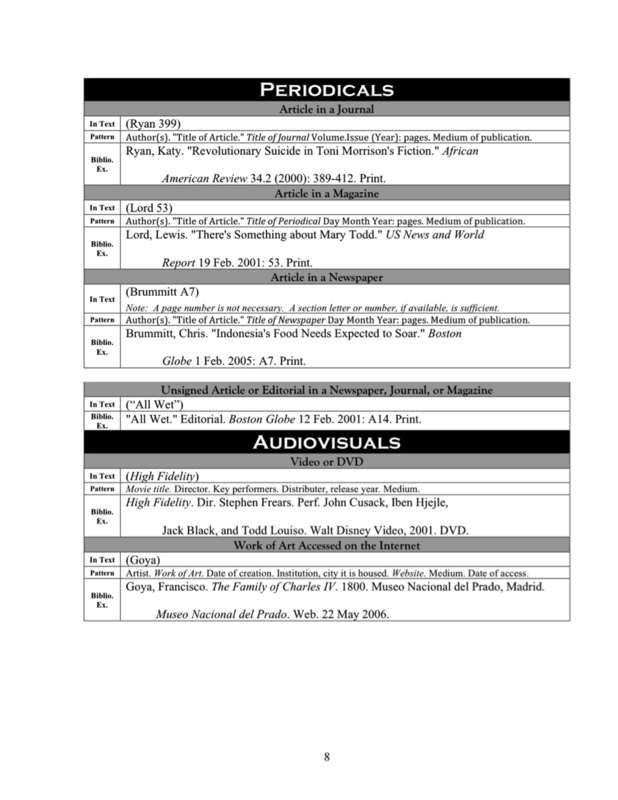 “Brent International School Manila: Language Policy.” (2009): 7 pages. Print. “Guidelines for Developing a School Language Policy.” Http://occ.ibo.org. IBO, 2008. Web. 7 Aug. 2013. “IB Learner Profile Booklet.” Online Curriculum Centre. IBO, 2009. Web. 07 Aug. 2013. “The New Curriculum Model.” Online Curriculum Centre. IBO, 13 Nov. 2012. Web. 07 Aug. 2013. All children have the right to progress intellectually, emotionally, and socially while maintaining a sense of dignity and developing a positive self-concept. Brent International School Manila recognizes that its students have varied backgrounds, interests, and individual learning differences. 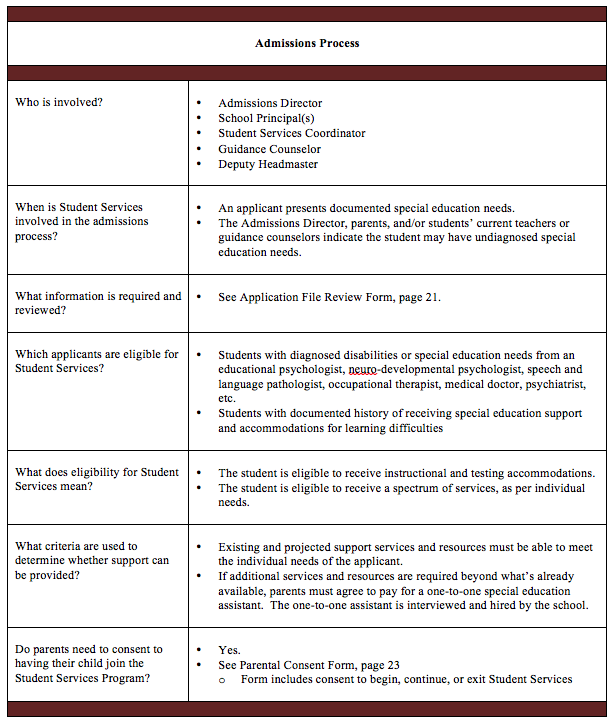 To that end, the Student Services Program is designed to increase the academic and emotional success of all Brent students identified with special needs. 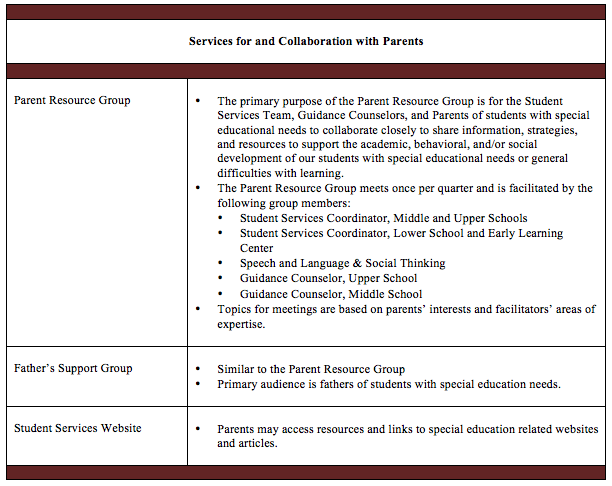 Additionally, the Student Services team members collaborate with each other, with classroom teachers, and with parents to design Education Plans that support the curriculum and provide appropriate goals for students having specific learning difficulties. 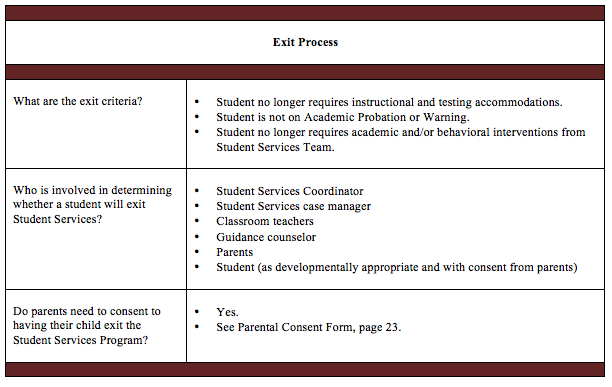 All Brent students, including those receiving student services, must meet and maintain grade-level standards and follow the Expected School Wide Learning Results (ESLRs). 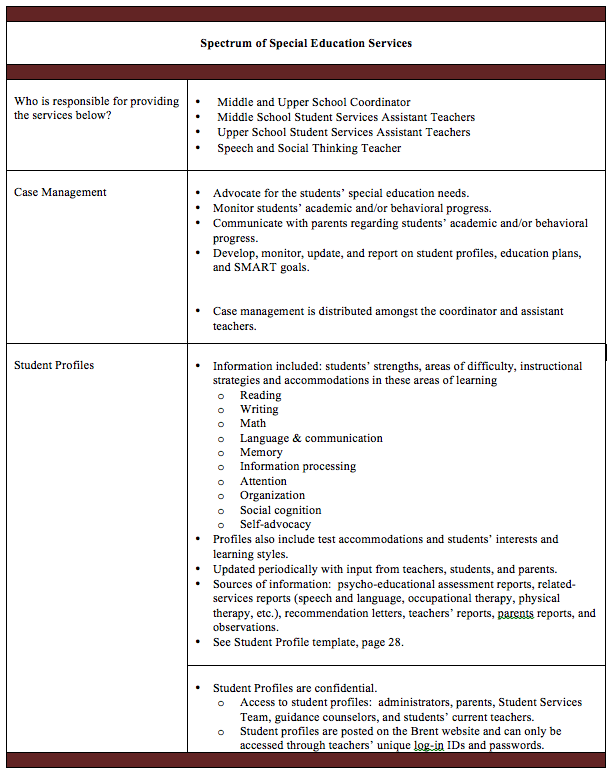 Who is included in our Student Services Program? 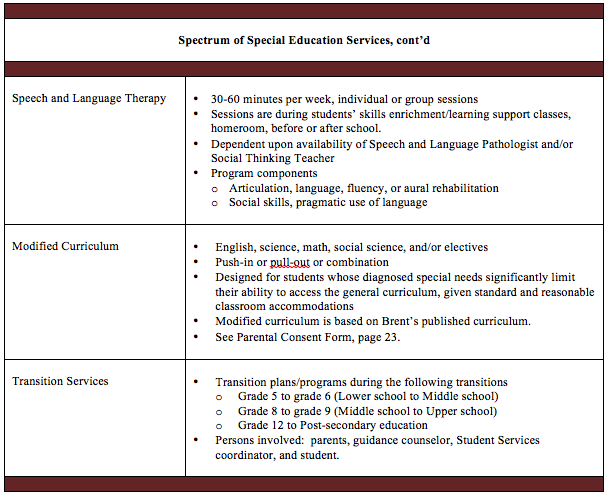 What services do we provide to facilitate fair access to the curriculum for our students with special education needs? 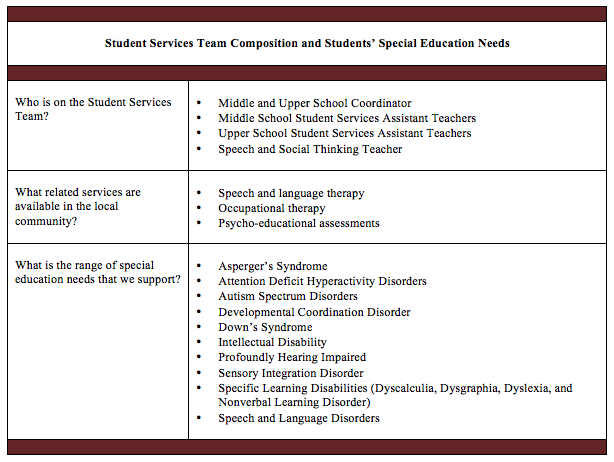 What services do we provide teachers to facilitate access to the curriculum for our students with special education needs? How do we collaborate with teachers to facilitate this process? What services do we provide parents and families to facilitate access to the curriculum for our students with special education needs? 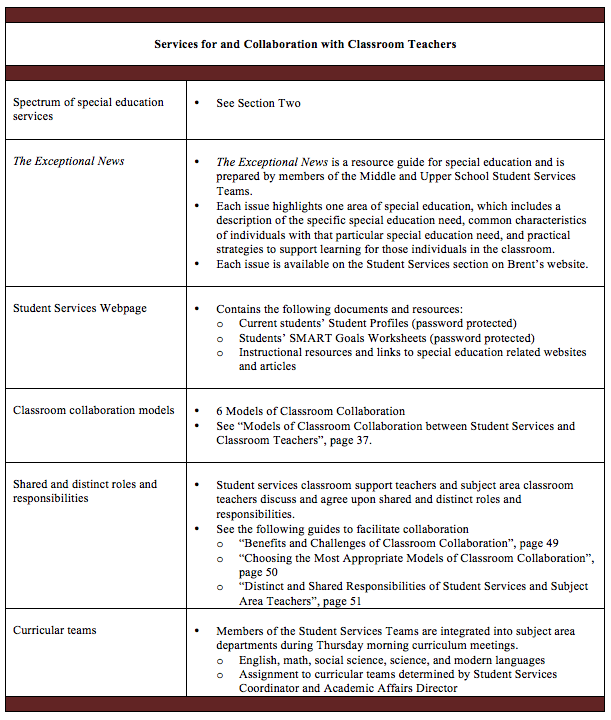 How do we promote and facilitate inclusion of students with special education needs within the Brent school community? With which community-based or international organizations are we affiliated? How do we build the capacity of our Student Services Team?